President of the Scudder Association Foundation, Inc. 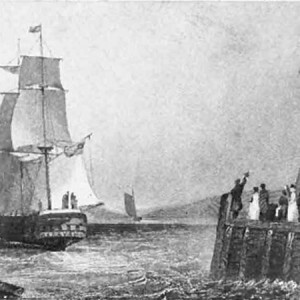 This Chronicle is a record of the trip to India by members of The Scudder Association Foundation in January 2019 to celebrate the 200th Anniversary of John and Harriet Scudder’s sailing from Boston to begin the medical missionary work of the Scudders on the Indian Continent. As far as we can ascertain, John and Harriet were the first American medical missionaries to arrive there. 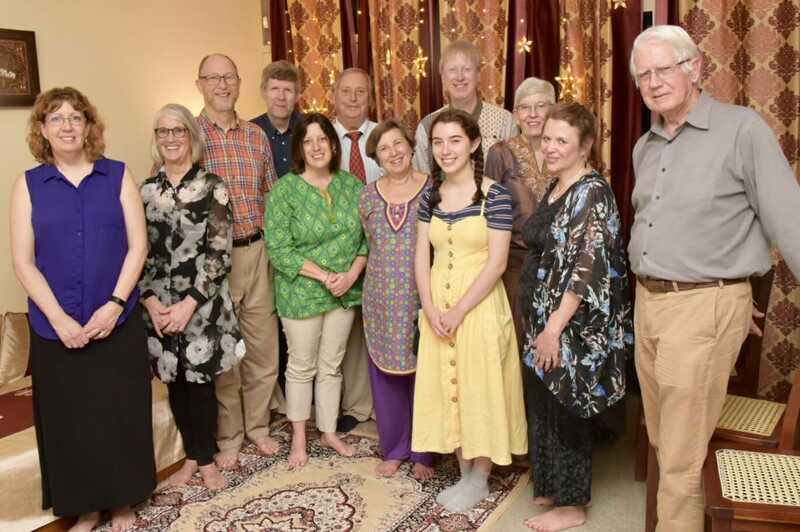 I begin this Chronicle on February 1, 2019 in the evening of the last day of the Scudder Family members’ trip to India sitting on the veranda of The Big Bungalow in the Christian Medical College campus in the outskirts of Vellore. This was Ida S. Scudder’s residence in her later years. It is comfortably warm as the heat of the spring and summer is not yet upon us. The lawn is beautifully mowed and maintained. The Magnolia trees are in full bloom. Geraniums are flowering in rows of pots. The dragon flies are enjoying themselves in the quiet evening. There is the sound of tennis balls from the court next door. Otherwise, all one can hear is the evening chorus of birds. This must have been one of Ida Scudder’s favorite places to relax and enjoy herself when she had a little time away from the rigors of her practice. 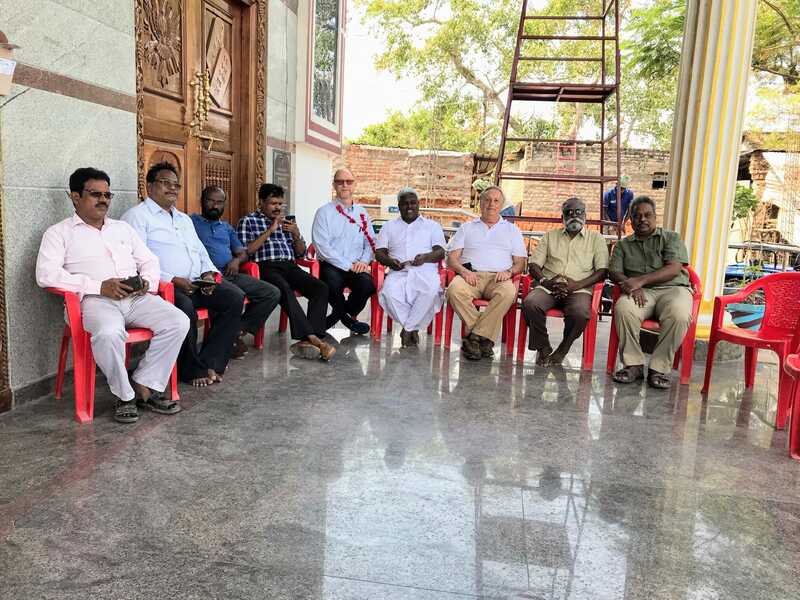 We had 14 Scudders and their friends participating in this weeklong celebration of the Scudders’ involvement in and contribution to Southern India over the last two centuries. It was an eye opener to me to understand the breadth of the family’s endeavors during that time, especially in the state of Tamil Nadu. The family’s commitment, not only to founding hospitals but also to establishing high schools especially for the poor and underprivileged dedicated to a Christian education, is quite remarkable. Those attending the celebrations were Cynthia (Cy) Scudder Sherman and her two sons Terry Scudder Sherman and Read Scudder Sherman, together with her daughter, Claudia Sherman Orchanian. 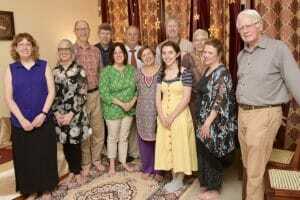 Also with us was Laura Fisher Kaiser and her daughter, Adelaide Kaiser, together with friends, Tema Kaiser Silk and Sarah Kaiser Hyams. Melany Scudder came in from Connecticut, and Jack Gilmar made his way all the way from Hawaii. Jim Taylor and his wife Susan were in attendance as they had arrived earlier in the week to attend CMC meetings. I brought up the remainder of the contingent. What I will do in this Chronicle is to document the travels of our family group over the week of our visit. We have taken many photos of our travels which are posted contemporaneously so you can get some real color to the description of our journey which I have endeavored to document below. Many of the family members converged from various parts of the world to the Trident Hotel in Chennai to begin our trip. Hugh Skeil at CMC had organized a small bus to bring us to our living quarters for the week at the College a few miles outside Vellore. Our accommodations were in the Alumni House adjacent to The Big Bungalow. We arrived about 12:30 pm in time for lunch at the Alumni House. There were then no organized activities until the evening. Some went shopping and others went to the Hindu temple in the ancient fort in the center of town. The evening began with a service at the chapel on the CMC campus, and we got our photo taken afterwards in front of the bust of Ida S. in the foyer of the chapel. We then walked across campus to have dinner at the invitation of Dr. Samuel Ram, a doctor at CMC with whom Jim Taylor had developed a relationship over the past couple of years. Dr. Ram’s apartment was a pleasant walk from the chapel with the exception of having to cross a busy road, which in India is no small accomplishment. Dr. Ram gave us an exceptional dinner together with a fascinating account of the development of the CMC hospital in the center of Vellore. Perhaps, most remarkably, he told us was that, despite its current size (nearly 9000 patients and 2400 operations a day), CMC is self-sustaining and without any government support. It draws upon those patients who are able to pay and ministers to the poor who could only provide nominal payment, while doctors and other medical staff are modestly paid. Hugh Skeil, the Manager of the Development Office at CMC, who had done a wonderful job of organizing the Scudders’ itinerary for the week, turned out to be a severe task master. 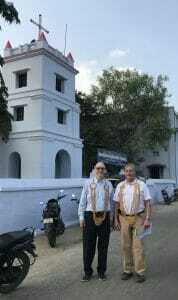 He insisted that we start out at 6:30 am to have breakfast at the Chittoor campus, about an hour away in the adjacent state of Andra Pradesh. We all dutifully piled into the bus on time and reached the campus to be greeted with a delightful Indian breakfast (at least for those who enjoy Indian breakfasts). The Chittoor hospital campus now is a series of temporary buildings erected in anticipation of the construction of a much larger institution. Over its first 2 years of existence the campus has rapidly grown to a full service secondary level medical facility, with hopes of developing into a tertiary level facility with a medical school. We were given a presentation of the grand plans and then taken on a tour of the existing facilities which seemed to be doing yeoman’s work in tending to the needs of the local populace in anticipation of the advent of the new campus. The tour included going through the wards full of patients, none of whom seemed to mind, unlike the US where privacy in hospitals is at a premium. India is so crowded that everyone apparently is used to always being with a throng of people. We were also given the opportunity to attend live operations in the surgical ward which those of us without medical training decided to pass up, and Hugh indulged us with a tour of the outdoor chapel. Jim was eager to see the operations, and some of the others in the visiting contingent went along for the ride. 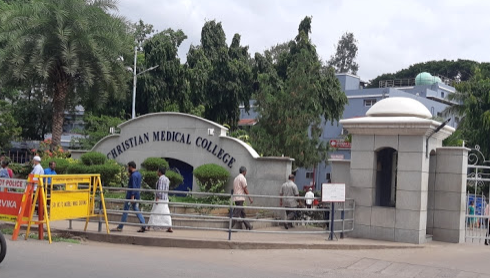 From the Chittoor campus, we returned to Vellore by bus to the main CMC hospital in the center of Vellore which is now the second largest hospital in India. 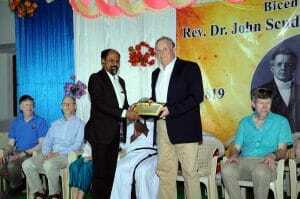 We were met there by Dr. J. V. Peter, the Director of CMC, who spoke to us about the development of the hospital. We had lunch in the cafeteria and then were given an extensive tour of what are now vast facilities attending to the 9000 patients a day. That all this has grown from Ida Scudder’s meager beginnings with her first clinic is quite remarkable. 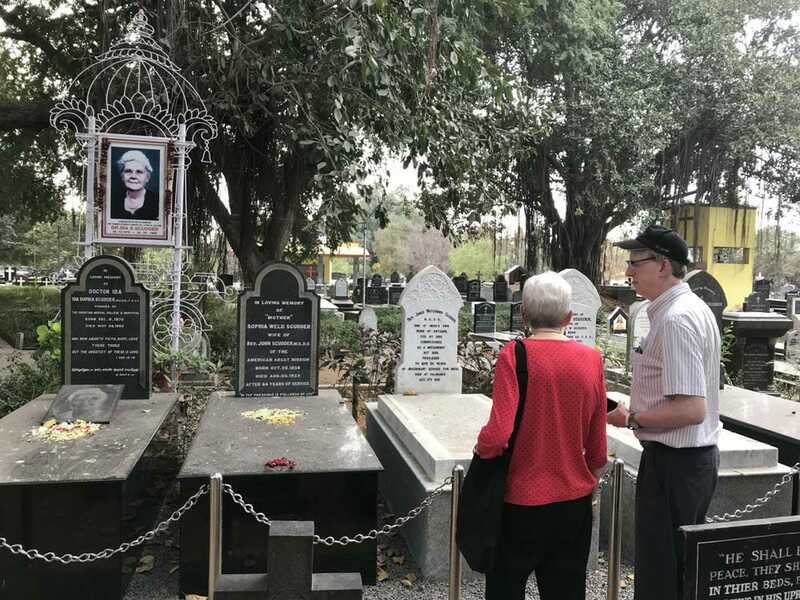 On the way back to the campus we stopped at the grave site of Ida Scudder and other Scudder family members where a life-sized photo of Ida adorns her tomb. Hugh had arranged a trip to the medical facilities in the Tribal Areas in Jawadhi Hills for most of our group. However, on Jim Taylor’s initiative, a separate trip had been organized to visit some of the schools which the Scudders had founded. 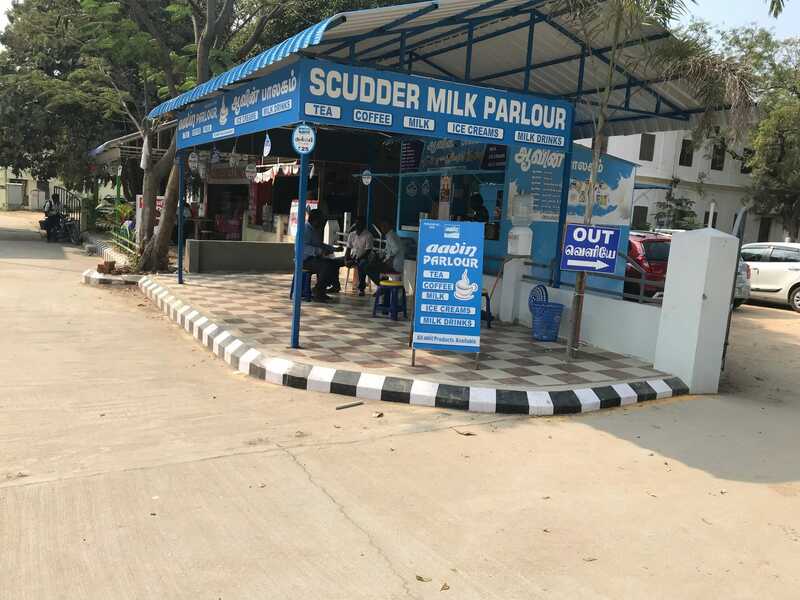 As the Scudder Association Foundation is presently funding one of these schools, I decided that it would be a good idea to go along to see where our money is going rather than joining the group going to Jawadhi Hills. The trip to the Tribal Areas was apparently fascinating and I am grateful to Terry Sherman who has provided the following description of the visit. 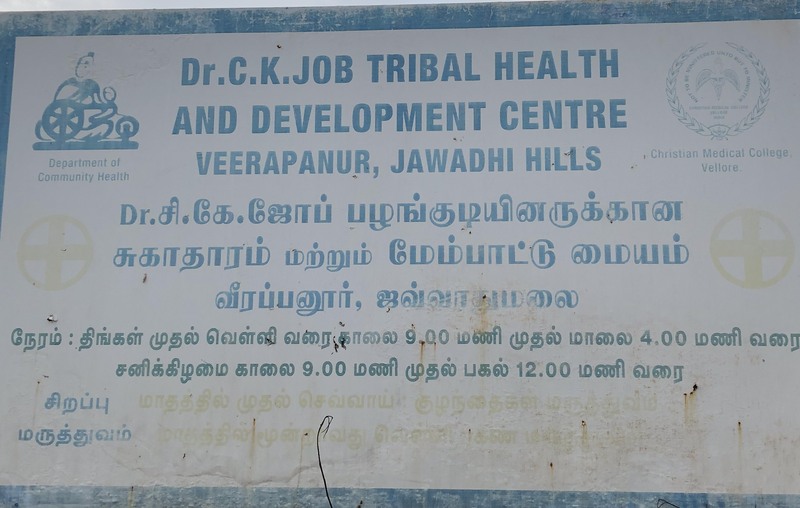 In the morning, part of the Scudder contingent set out for the CHAD (Community Health and Development) hospital in the Jawadhi Hills, winding up the many breath-taking switchbacks and finally arriving at the Dr. C.K. 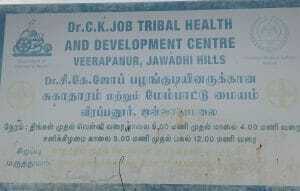 Job Tribal Health and Development Center, in Veerapanur. The Health and Development Center was established in July, 2014 and is situated on land leased from the Don Bosco Institute. The Center is manned by a doctor, a nurse, a health aide and house-keeping staff. Currently the Center functions Monday through Saturday from 9 am – 4 pm with the team traveling from Vellore each day, some 2 hours away. While the original purpose of the Center was to eradicate Hanson’s Disease (Leprosy), that debilitating disease being largely cured, the patients are usually those with acute illnesses, non-communicable diseases, antenatal concerns and children. Additionally, special clinics are run from the Center on specific days of the month. When the needs of the patients are beyond the Center’s capabilities, they are referred to CMC. We were impressed by the dedication of Dr. Anu Rose and her staff as they seek to serve the 40,000 of the 80,000 tribal people of the Jawadhi Hills through mobile clinics, community organizing, capacity-building of traditional leaders, self-help groups, life skills and vocational training for youth and support of formal education. Another major focus of this project is the development of Model Villages. After a picnic lunch, we climbed into the van and drove to one of these model villages of 98 households named, Vallithathankottai. Stopping along the side of the road, villagers came out to meet us, cut open coconuts for us to drink and then trekked with us through the dry fields to show us the new water wells that have been dug for irrigation. 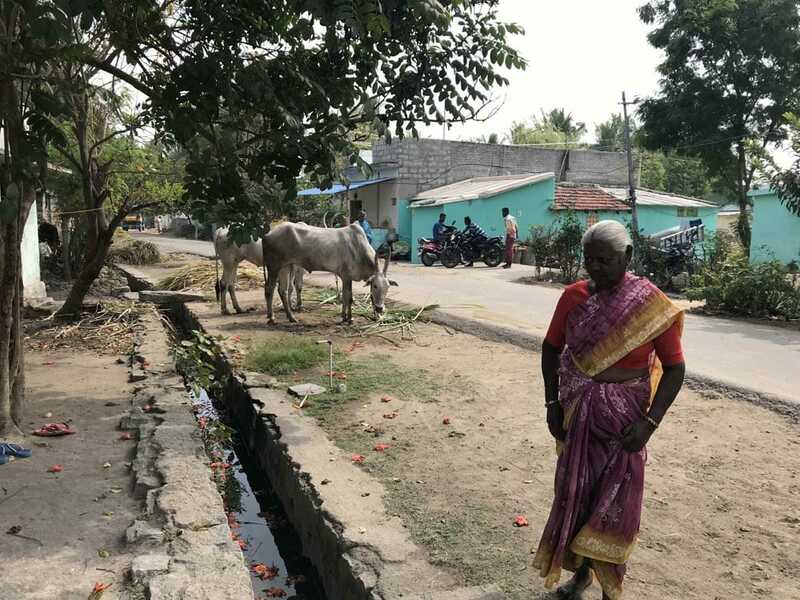 We were also taken to see a model working toilet that has been successfully introduced to each household and to hear from the social director, Mr. John Paul, about the strategic plan for governing each of these villages. We were intrigued to learn that for community organizing, a program was started to generate income for the town. Each household received an animal, whether a cow, goat, chicken, pig, fish or bees. Eight families with agricultural wells had their wells desilted and deepened. All families with farmland received 100 fruit tree saplings. The money is combined and controlled by appointed leaders who manage the funds for the town and seek the wellbeing of the whole community. In an interesting turn, the villagers are expected to pay something for each of these opportunities and then the payments are used for the benefit of the town and its people, sometimes for supporting a student in school, or for town festivals, or improvements, thus building value, responsibility and ownership. Our visit with the villagers from Vallithathankottai finished with cups of tea, selfies and a gift of a flower for each of us. Our hearts were warmed as we said goodbye, stopped by the Center in Veerapanoor one last time and headed down the windy road for the two-hour treck back to Vellore. The Scudder Association Foundation provides financial support for CHAD and the Jawadhi Hills project. While Terry and others in our group were off to their excursion to Jawadhi Hills, Jim Taylor and I took a separate van to see Arni High School to which we have been providing modest funding for several years. We then proceeded to the. 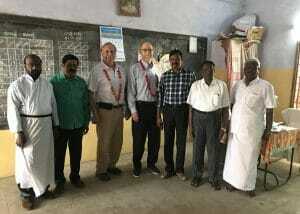 L. R. Scudder high school in Arcot. 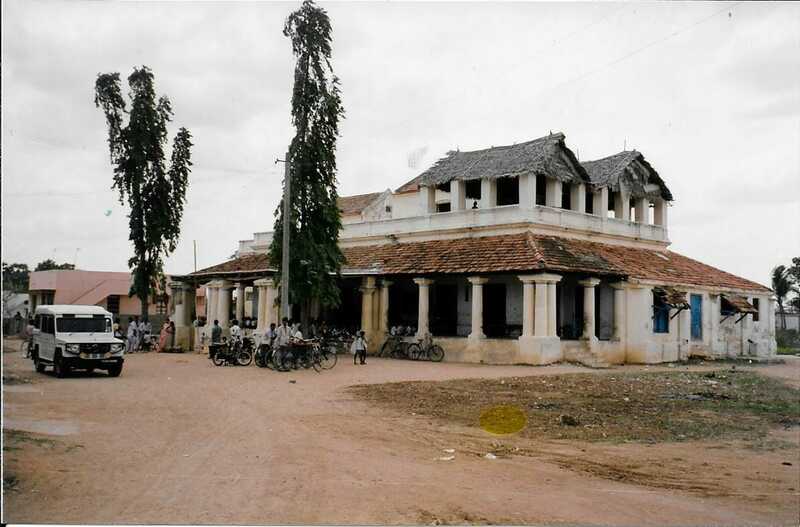 Arni is a city of about a hundred thousand which lies 25 miles southeast of Vellore. It has a rich Scudder legacy. The Arni church was founded by Rev. Joseph Scudder and his wife, Sara Anna Chamberlin in 1853. The original church building was completed in 1854, followed by the school and bungalow in 1857. After Joseph, Ezekial Carman Scudder and his wife Sarah Tracy served the Arni mission. Upon our arrival at the school, to our surprise, we were met by the entire student body complete with marching band. After being decked out with garlands, we were escorted like visiting royalty down the Main Street to the main school building. There were then speeches for the entire student body to which Jim and I contributed through an interpreter. The band played again which I caught on video (click on the picture for the video). There followed a tour of the very basic and dilapidated campus. The real revelation of how important our contributions are to these schools came when we went into the main assembly hall which was completely empty. We were shown open shelves on one end with the students’ clothes and belongings. Piles of straw mats were arranged neatly on the other. We were told that these were the students’ only possessions and that they all slept together in that room on the floor with only the mats for their bedding. We then visited the chapel which was the structure in the best shape of any on the campus. One of the staff climbed a coconut tree and cut fresh coconuts for us. Needless to say, it was brought home to Jim and me how meaningful even a small contribution means to this school. Bidding our farewells to The Arni School, we were taken to CSI Geshsemane Church in Arni, where we were constrained to sit with the church dignitaries for the obligatory tea/coffee and biscuits. We were then a little tight on time but moved on to the L R Scudder School in Ekambaranellore Village, about 11 miles northeast of Ranipet. 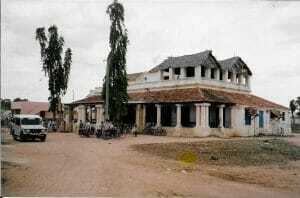 The congregation in Ekambaranellore was founded by Rev. L. R. Scudder, son of W. W. Scudder. 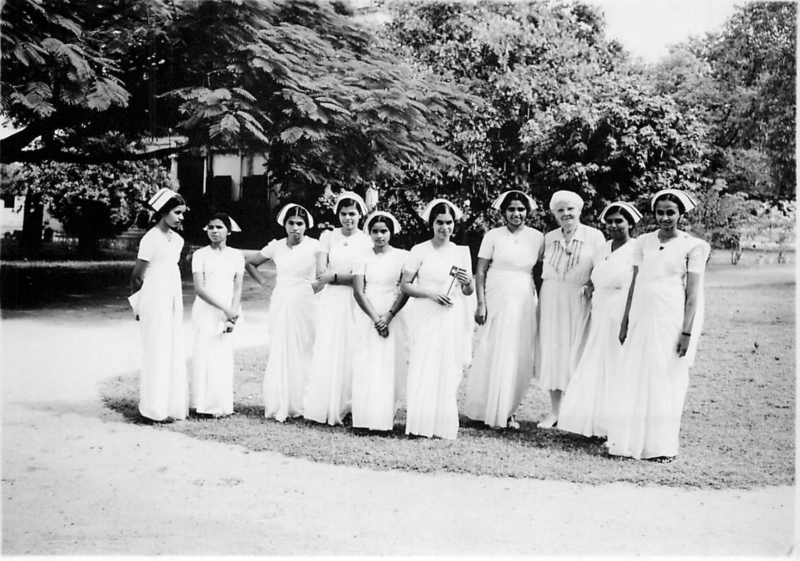 The L. R. Scudder School was founded by the Ekambaranellore congregation in 1986. We were met with a similar and even more elaborate reception complete with another marching band and more garlands followed by the obligatory round of speeches. On the way out, we made our way through the student body, many of whom I believe had never seen a non-Indian in person, and everyone wanted to shake our hands. We felt like rock stars. We have not provided any funding to this school before, and, needless to say, we were presented with all sorts of formal solicitations for contributions. 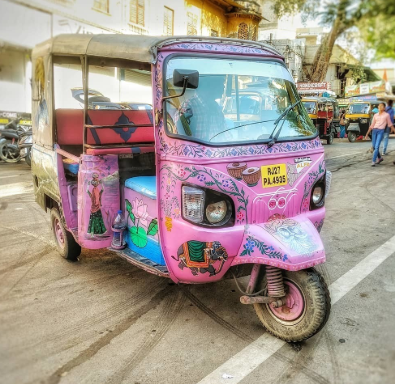 That evening, most of us took the motorized rickshaws called “tuck tucks” down to a restaurant in Vellore at the Darling Hotel which had a delightful open-air roof restaurant for dinner. If you have never been to Tamil Nadu before (like me) you have no idea what a hair raising experience it is to ride in a “tuck tuck” with the semi controlled chaos of bicycles, motor cycles, “tuck tucks”, cars, busses and gigantic trucks all going as fast as possible, honking their horns, disregarding the median of the road and trying to pass one another in a frenetic attempt to get to wherever they are going as quickly as possible, not to mention the errant sacred cow who wanders out into the middle of this mayhem. One feels especially vulnerable in a “tuck tuck” which is essentially a motor cycle with a canvas covered rumble seat in back and a maniacal driver trying to prove that Mario Andretti has nothing on him. Any wrong move by the driver and you are toast! Not surprisingly, Tamil Nadu has the highest road accident and mortality rate in India (and for that matter probably the world). Needless to say, the Scudder hospitals are greatly appreciated. I just had my fingers crossed that I would not end up as a patient in one of them (my “tuck tuck” did get side swiped by a car on the way back going in the opposite direction, although neither stopped to examine the damage). In the end, we all survived, and I am here to tell the tale. On Wednesday morning we were met by Reena George who has just published a book on the history of CMC. (We will have a few copies for sale soon.) She took us on a tour of the central parts of the campus which were quite idyllic in some places, with wonderful formal gardens surrounding a pond. We then took the bus to the mission bungalow where Ida S. first operated her dispensary in 1901. Apparently when she first opened it, no one came, and she began wondering whether anyone had heard about it. Of course they had, but the problem was that it was run by a woman. At that time, early in the 20th century, people were wary of going to the dispensary because of that. However, once she successfully treated her first patient, the word got out that it was OK to go there, and she soon had more patients than she could handle. We then visited the nearby Shell Eye Hospital and the Low-Cost Effective Care Unit, which provides basic medical services for the urban poor. The next stop was about an hour away on the bus to see the new Kanningapuram Campus. This is an enormous project still under construction covering hundreds of acres. 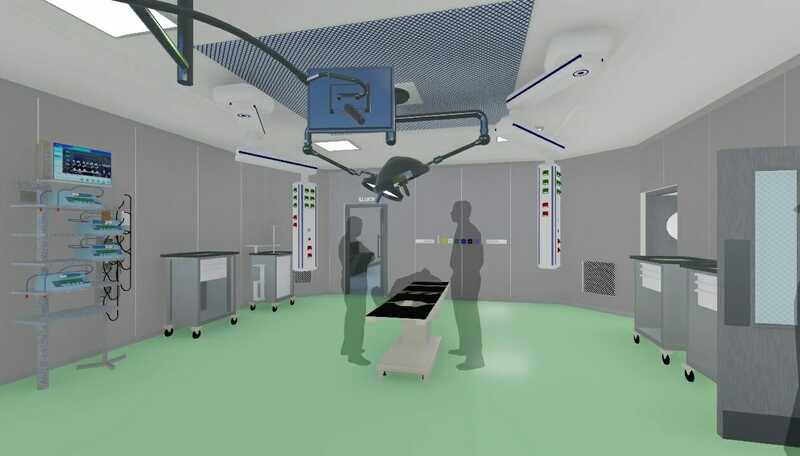 It is being designed to take a substantial amount of the overcrowding off the CMC hospital in Vellore. Many of the specialty disciplines will be moving here. 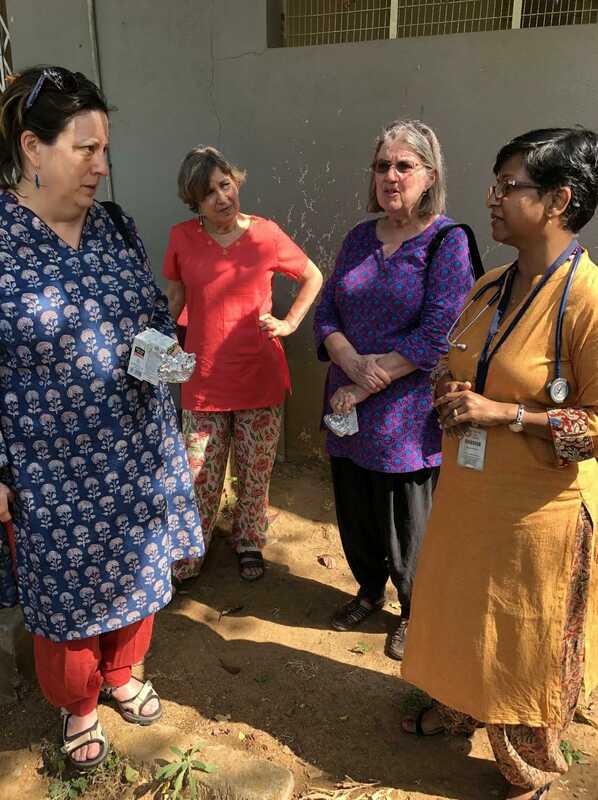 After lunch at the base trailer at the construction site, we set out for Scudder Memorial Hospital where we were met by Dr. Anbu Suresh Rao. We were escorted into the hospital past the Scudder Ice Cream Parlor to be given a presentation on the history of Scudder Memorial. It was a real revelation to many of us to learn how run down the hospital had become a little over 10 years ago. It was in such bad shape by 2007 that there was thought of closing it down altogether. 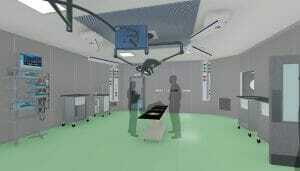 Then in 2010 Dr. Sharesh was put in charge of bringing the hospital back to life with the support of CMC. Over the past decade, Dr. Suresh has done a remarkable job of resurrecting Scudder Memorial. Rooms, clinics and wards have been completely renovated, patients have been brought back, and education is thriving. Significant plans for continued renovation and expansion are in the works. We toured the hospital and were then brought to a campus-wide gathering of faculty and students for a series of speeches and presentations on the Scudder family role in Scudder Memorial.The cornerstone for the new Rev. 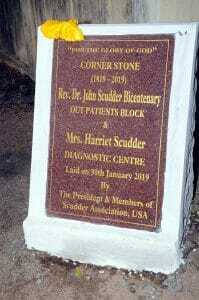 Dr. John Scudder Bicentenary ‘Outpatients Block’ and Mrs. Harriet Scudder ‘Diagnostic Centre’ was laid. As dusk fell, all of the visiting Scudders were brought up on stage and seated for the speeches. Everyone was presented with a commemorative plaque, and various dignitaries made speeches about the Scudders’ role in the hospital over the years. After making a short speech thanking the hospital for the wonderful reception for the Scudder Family, I called Dr. Suresh up to the podium and presented him with the total Scudder Association Foundation’s contribution to SMH for this bicentennial year which was a combination of Foundation funds and individual Foundation members’ contributions amounting to approximately $73,000. Following the ceremony, Dr. Suresh took us all to dinner. We made it back to campus about 10 pm after a very full and rewarding day. Our last day was dedicated to visiting RUSHA, which stands for Rural Unit for Health and Social Affairs. 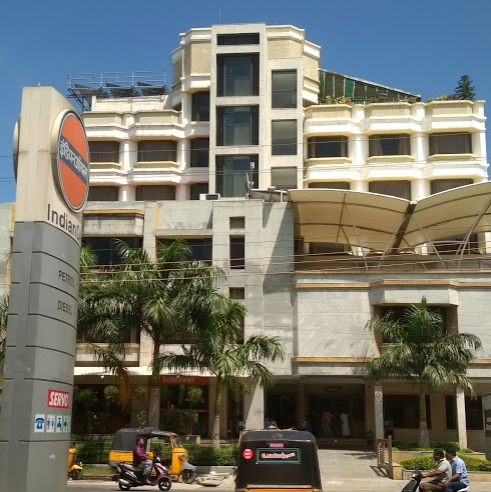 The headquarters for RUHSA is located in the K. V. Kuppam Block of the Vellore district, about 10 miles northwest of the main campus in Vellore. RUHSA combines primary and secondary healthcare with an innovative model of addressing the social and economic issues plaguing this impoverished area. Technical education is given to school dropouts, so they can have a reasonable income as mechanics or beauticians. Village outreach programs provide elder care and develop agricultural cooperatives. 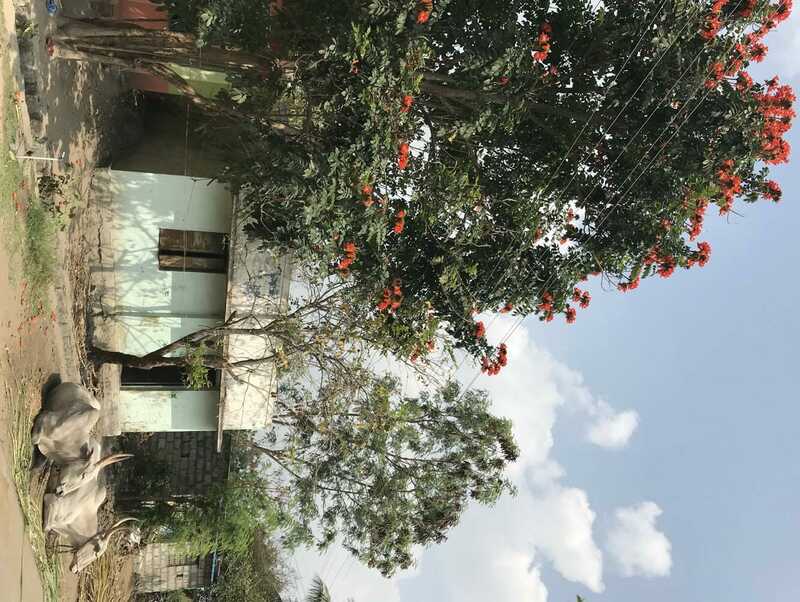 Our first visit was to a modest collection of buildings housing a clinic for very basic medical services as well as vocational training for the local youth. There were separate classrooms to teach about motor cycle engines, another for servicing refrigerators and air conditioners and others for various different trades. The second location was a small village with one main street and the ever present sacred cows lounging around an open sewer. There was a two-room structure on the side of the road which served as the RUSHA base as well as an old people’s day care center. We were told that the residents often sang together so we asked for a song and they obliged. I caught this on video and then played the video back for them which they seemed enthralled by. I doubt if any of them had seen themselves on video before. We stopped at yet another RUHSA location whose additional function was serving as a middleman for local farmers’ milk. Many of the farmers were there and had brought their milk in for sale. Because it was processed through the RUHSA unit, the farmers received a much better price than if they had to sell to some commercial establishment. In recent years, the Scudder Association Foundation has been providing financial support for RUHSA. 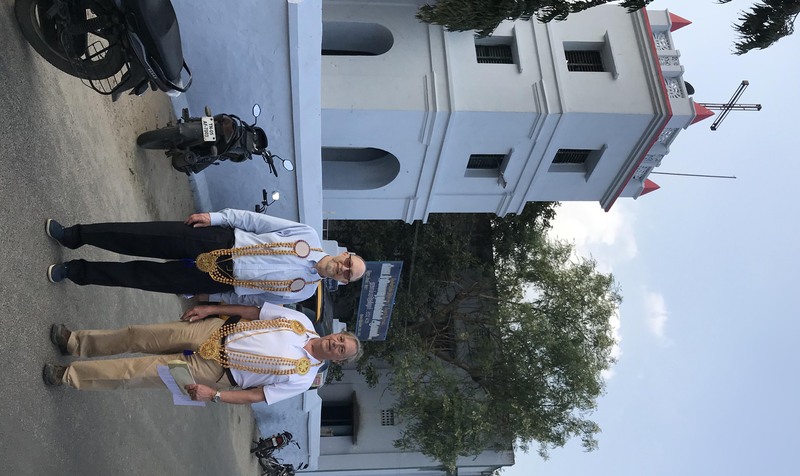 We finally returned to the CMC hospital in Vellore and managed to get hold of Hugh Skeil who graciously took us to a late lunch. As it was now getting quite late, most of the group decided to forgo the visit to the College of Nursing. Jim was the only one to have the energy to go, so Hugh escorted him on his own while we took the bus back to the College. Jim writes that he made it to the Nursing School with the help of Hugh and provides the following description of his visit. The Nursing School is a large walled compound a few minutes east of CMC. Getting there involves a sensory assault of sight and sound and human density. Passage through the gate of the hospital reveals a calm, quiet and secluded place. In addition to the nursing school, the campus has extensive library facilities. There is also high-rise housing for nursing students, house staff and medical faculty. Typical of CMC facilities, the centerpiece is a chapel. This one had a circular, swirling design with the recent addition of stained glass windows. When we had all made it back to the Alumni House, I prevailed on the good kitchen staff to let anyone in our group stay and have dinner there so we would not have to take our life in our hands again to take a tuck tuck to have dinner in Vellore. Some of the crew had left on Thursday evening, but we had a final breakfast in the Alumni House in the morning, and the Taylors and Cy Sherman and her family departed. 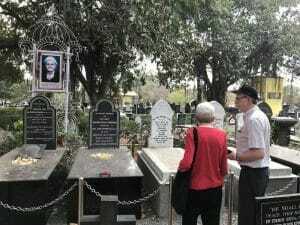 On their way home they visited the Tindivanam site, the legendary site where Ida S. had been approached by the three men with wives in labor who at that time could not be attended to by male doctors and who died the next morning. 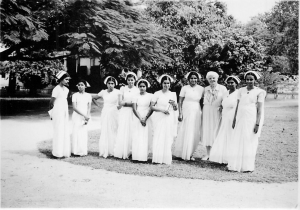 It was this that inspired Ida S. to return to the US, get her medical degree from Weil Cornell in New York and return to India to establish a clinic for women which over the past century has evolved into CMC. They also visited the Walter Scudder School also founded by our forbearers and were again given a regal welcome. I spent the day on my own first climbing Aunt Ida’s mountain behind the College and then repairing to the porch of the Big Bungalow where I am writing my narrative. It was an intense and highly informative week which has opened my (and many others’) eyes to the extent of the Scudders’ legacy in Southern India. 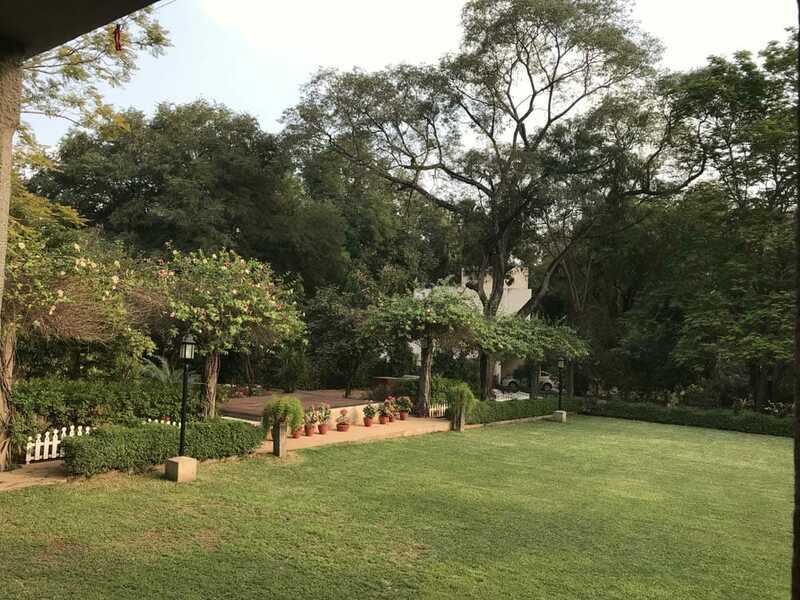 The Scudder Association Foundation should be extremely proud of its heritage over the last two centuries in India and make every effort to keep it going. Thank you so much for writing this delightful account of your visit. It brought back many memories of my visits to CMC&H and also to SMH. (My great-grandfather, Dr. Silas Scudder, founded SMH in 1866.) In 1978 Dr. Ida B. Scudder and D.V. Scudder and I went to India to help celebrate the 50th anniversary of the opening of the “new” Scudder Memorial Hospital in 1928. D.V. was there to dedicate the new CMC&H blood bank named in honor of her husband, Dr. John Scudder (a pioneer in developing blood banks) who had served there for 5 years. I returned as a member of a delegation from the Vellore Board (I served on that board for 10 years) in the 1980s and later as a rep of The Scudder Association for the dedication of the statue of Aunt Ida in Vellore. My father, Hamilton Cochran, (Silas’ grandson) served as president of The Scudder Association in the 1960s and later in the 1970s both my husband and I also served as president. D.V. Scudder was secretary for many years before Cy Scudder took over. It’s wonderful to see my nephew, Dr. Jim Taylor, and his wife, Dr. Susan Pepper, so involved with both the hospitals and the Association. Good Scudder work continues!! Keep it up! Thanks for your comments. We really had a wonderful trip, and I am glad you enjoyed my write up. We would love to have you back and active on the Board if you have the time. 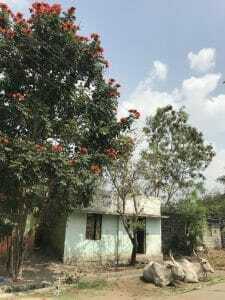 This is a delightful account of your visit to Vellore and Ranipet and the surrounding areas. Thank you for sharing! I am so glad the Scudder family was able to visit my Alma Mater, Christian Medical College, Vellore where I spent 6 of the best years of my life! I hope this will be the first of many visits of the Scudder family to this area where Aunt Ida, as she was fondly known, founded the Christian Medical College for women 100 years ago. 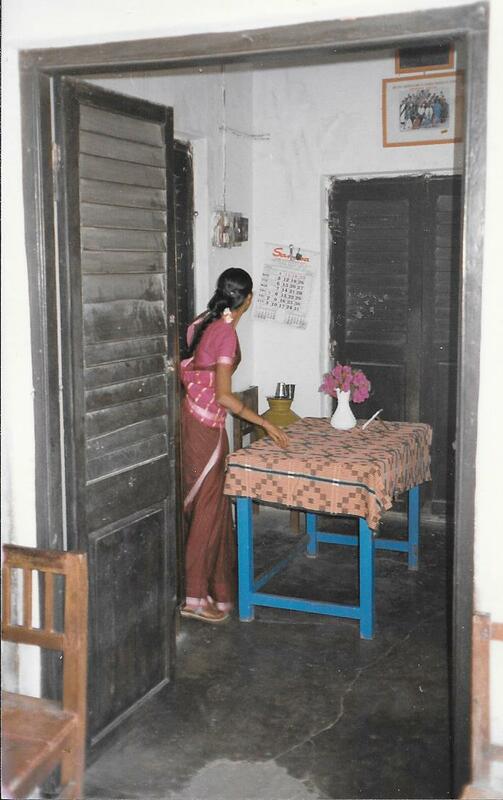 The founding of a medical college for women by a woman to care for women is a remarkable achievement. As Chair, and on behalf, of the Board of the Vellore Christian Medical Foundation, we are honored to continue our longstanding partnership with the Scudder Association Foundation.